Each year Crabtree holds a spring plant sale for the public. We spend 4-5 months preparing for the event, with the last 2 months requiring the most intense and broad-reaching staff focus and time commitments. 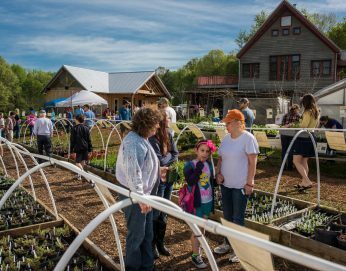 We do this for several reasons, the two most important being, to connect with and support our community’s vegetable gardening needs, and to financially support our farm. Crabtree was started as a nonprofit education farm with a goal, of several, to show that sustainable growing practices in agriculture could also be sustainable financially. Now, twenty years later, a pivotal piece of that financial sustainability is our plant sale. Each year the spring and fall plant sales, combined, bring in approximately 30% of the farm’s operating budget. Not the organization’s budget, just the farm program. Without the success of our plant sales, Crabtree couldn’t exist. The plant sale also occupies a unique niche in our community. All the varieties of vegetable, herb, fruit, flower, and landscape plants have been chosen because they do well in our region, or, in some instances like turmeric and lemongrass, because they are delicious and with the right attention can be grown in our region. Almost all the plants offered have been tested, from seed to harvest, here on the farm at one point or another. The other reason we love our sales is they are the 3 days in a year when we get to surround ourselves with local artisans, invite a horde of diverse gardening enthusiasts and watch the mischief and mayhem unfold. There is so much laughter, energy, and sharing during the festival days of our plant sales. It is a perfect fusion of our mission to grow, educate, and connect.